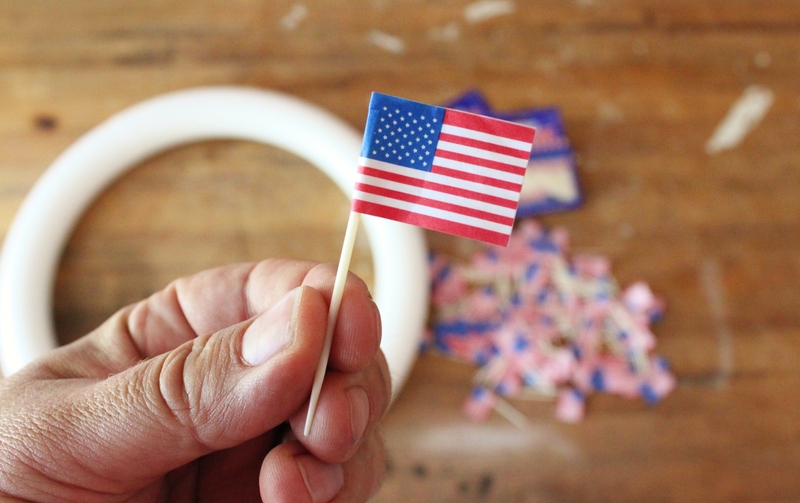 Say you’re sitting around with about 600 American flag toothpicks in your possession. Just using this as an example, mind you. 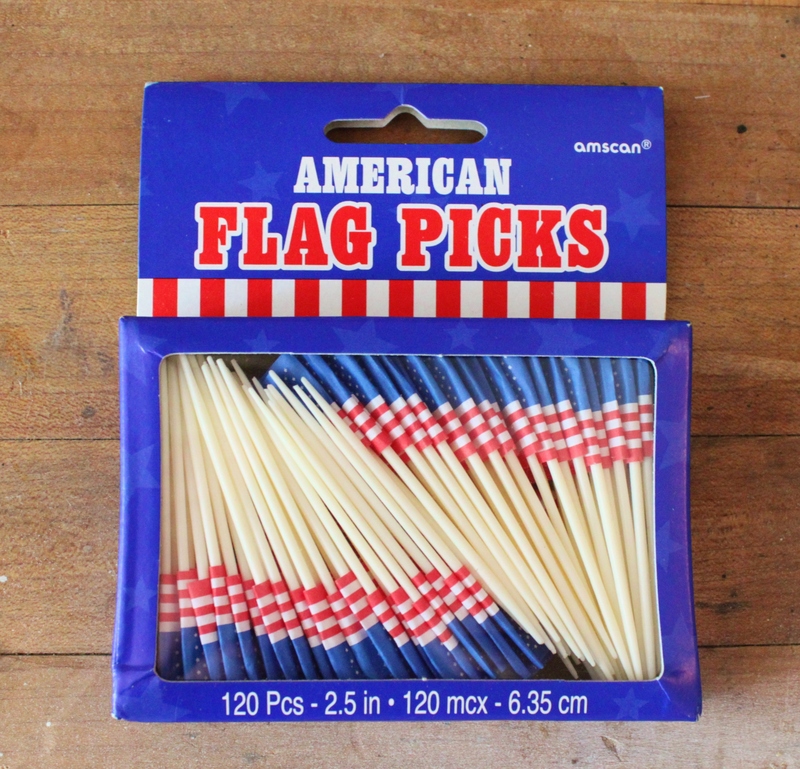 I mean, who just happens to have several hundred American flag toothpicks on hand? (pause, followed by uncomfortable forced little laugh)………guilty. Why did I let that happen? Was I really going to make that many cupcakes? I found them for 30 cents a box a few years ago……and pounced without really thinking it through. And now, after several cupcake-less July 4ths, I think I’ll use them to make a wreath. On the off-chance that one of y’all isn’t quite the hoarder that I am, and wants to copy this project…..I found the same toothpicks for sale on Amazon. I also have this 18 inch white styrofoam wreath form. Pretty sure that I got it at Hobby Lobby. 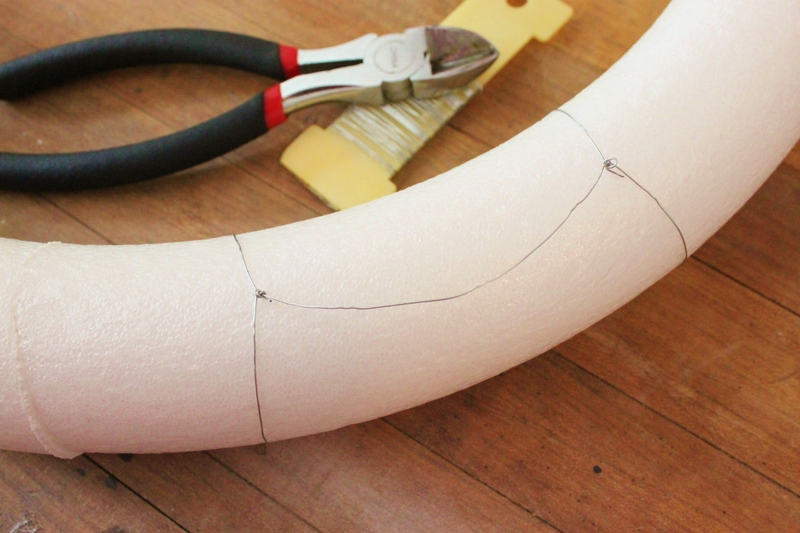 I used a little wire to make a hanging loop on the back of the wreath form……….like so. and go to town sticking in the flag picks. I tried to get them as close together as possible, and at a slight angle. After I covered the entire wreath, I went back over my work and added a flag everywhere there was a hole. After all, I have several hundred of those little picks. Might as well use all of them. Happy Fourth to you too Mary! It is a great book Donna…….so glad that you got one! I have seen (via your blog) every handsomely decorated room in your house plus your awesome garage, so I am always puzzled when you pull out some of your hoarded items and turn them into something I want. My question is: Where in the world do you hide all these things (“since the Bush admin”??) until you need them for a project? Were these flags stashed in that master bathroom that you’re always referring to as your Storage Area? LOL, there is a tub in the garage full of American Flags…all types. Right now Jamie is pinning bunting to the front porch. We have slowly been emptying the bathroom…..only vacuum cleaners in there now…..The Attic, on the other hand…..is packed! Oh my GOSH that is just perfect! Actually a patriotic wreath I like!! Just call that hoarding “planning ahead”!! “Planning Ahead” is the exact phrase I’m going to use from now on! Thank you for that. This was a pretty clever idea, although I’m inclined to say that I’d take some of those 600 cupcakes off your hands. I’m a vanilla with cream cheese frosting kind of gal, for future reference! You know, I’ve only made any sort of wreath once in my life. I was ten years old and my mother announced that she would be making Christmas wreaths and that I had to help her go “gather supplies” under the cover of darkness. Next thing I knew, we were in our pajamas wading through the New Hampshire snow, then cutting bottom branches off of landscaped pines on private property while we left the car idling until we sprinted back to make our getaway. I guess that makes us wreath Grinches? I absolutely love that story! There’s a golf course down the road with huge cedar and holly bushes and every year I want to “borrow” some for my own holiday decor……just might this year…..
That is so cute and out of the box. Thanks for the idea! Thanks Melissa….so easy to do also…. 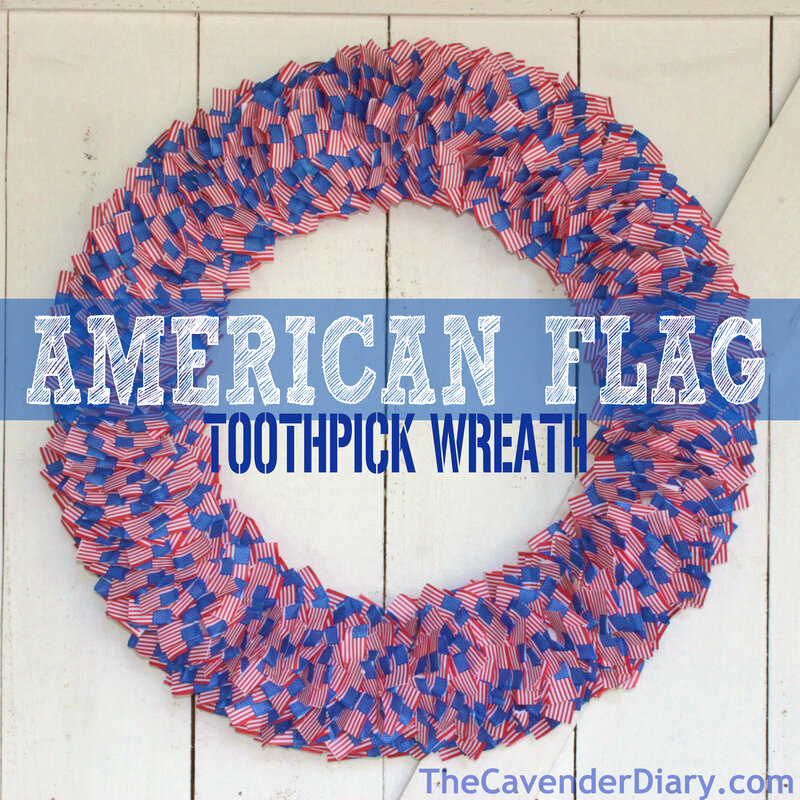 This makes me want to hoard little American Flags…and make a wreath during the cold winter months…. Hi Robin, sounds like a great plan! Is it okay, if I admit I was pulling for the 600 cupcakes? The wreath looks great too but hard to beat your Christmas wreath. Love it !! I appreciate the patience it must have taken! Happy 4th! Not tooooo many hours…but it took a while. Happy Fourth to you too!!!! I’m behind on email, so glad I saw this post before the holiday tomorrow! Great idea…as usual. 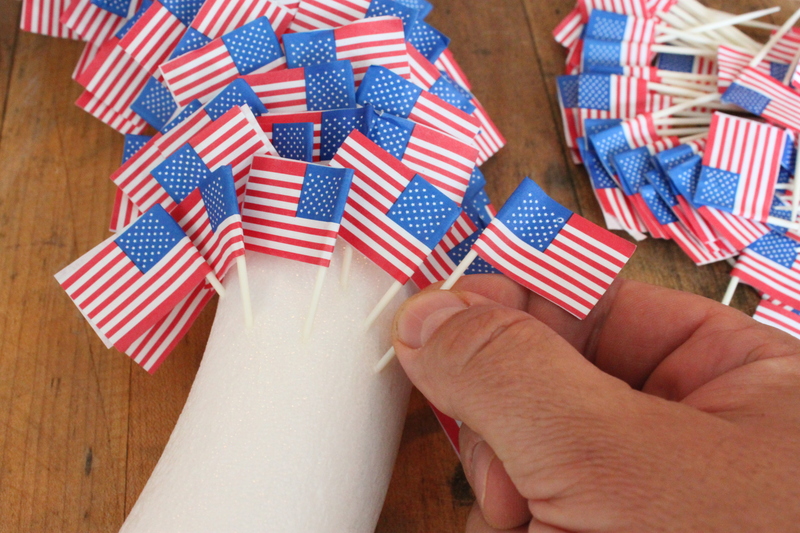 Jeff, We raced to get this done in time to enjoy it for the holiday weekend…..Plenty of time for you to make one for next year…..Happy 4th!!!! Back at ya! 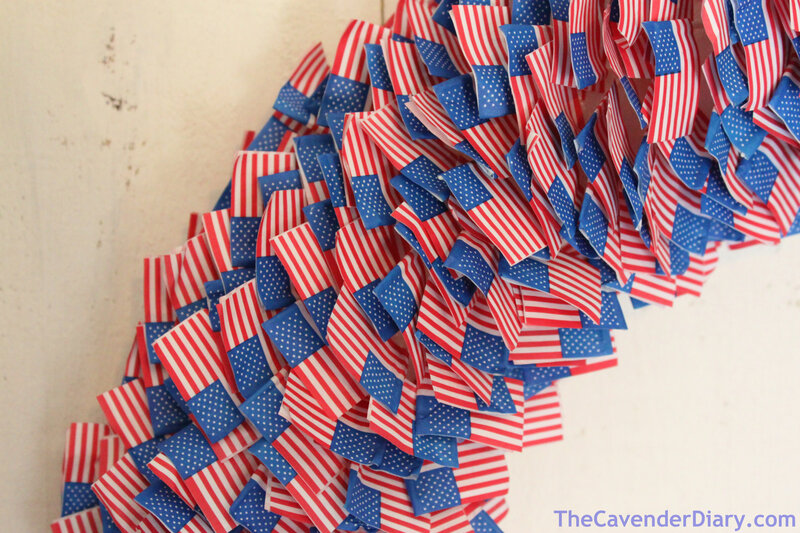 I fell in love with this project, even though I didn’t have 600 flag toothpicks hanging around. 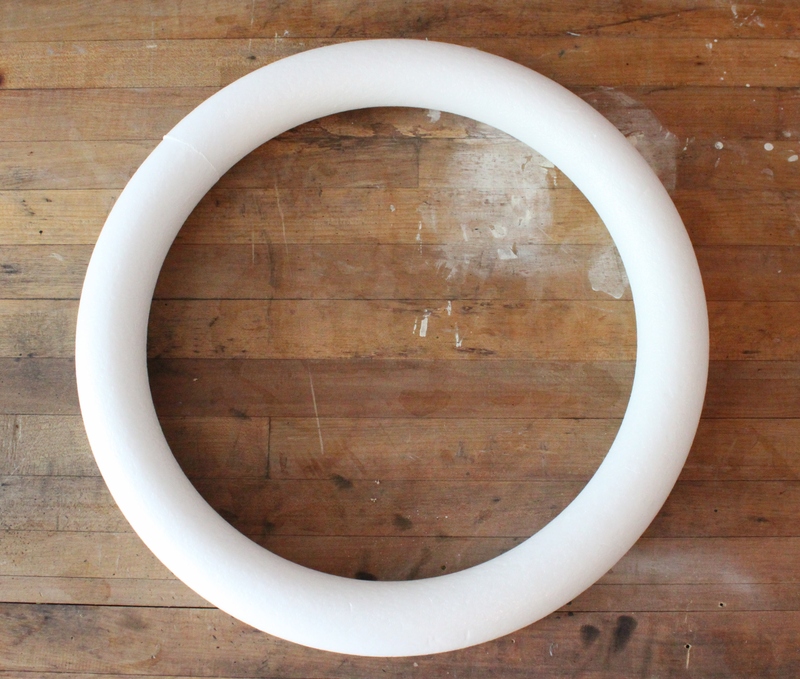 I did, however, have a 10 inch foam circle, and a love of my heritage. First I am an American, from Canadian parents who became Naturalized, and Scottish grandparents and I love each branch of that history, so I found American, Canadian and Scottish flags at PartySwizzle.com for quite a bit more than you paid at the Dollar Store, but still not that expensive, and I purchased 300. It will hang with the American Flag up on top for Memorial Day and the Summer holidays, the Canadian part on top for Victoria Day, Canada Day and other times when I think it should, and the Scottish flag on Feb. 1st for Robert Byrnes, on April 16th to honour the losses at Culloden, and during the time Outlander airs on Starz. (hehe) I will make it sometime this weekend, since my thumb is sore from quilling and knitting. Hi Muriel, I LOVE that idea! I’d love to see a picture of the finished wreath…after your thumb heals, of course, …feel free to send a few. I love to see how we’ve inspired internet people.